The season of Advent is here! I’m excited to celebrate this season together as a church. I’ve always loved the traditions, songs, and scriptures that are used throughout the season of Advent. But why do we sing different songs, light candles, use certain colors in our church gathering, and focus for four weeks on the story of Christ’s incarnation? Why do we observe Advent and how does God use it to grow us to be like Christ? Advent means “coming”. It’s a season that works to grab our attention and help us remember that our hope, peace, joy, and love can only come from Christ. It’s why each week, and candle in the Advent wreath, follows those four themes. Observing Advent together as a church is a way that we keep Christ at the center of all our Christmas festivities. We plan our Sunday gatherings around the Christmas stories in scripture, allowing God’s word to shape our hearts, traditions, and imaginations. It helps us appropriately enjoy and embrace all the activities, presents, family, and fun as gifts of grace from our good father. The season of Advent tells us the true story of the whole world. It reminds us that Christ has come and done something about the brokenness and sin of our world. It helps us remember to look forward to the coming light of Christ’s return. Advent is a time to honestly acknowledge and express our true needs to God. Here again we see how the Advent story collides with our consumerist and image obsessed culture. What do we really need? More toys, perfect holiday memories, bonuses, vacations, or promotions? No, we need a savior who comes as a vulnerable child and conquers sin, death, and evil for us. We need a savior who will return again to make all things new as he wipes away every tear from our eyes. No amount of money, influence, presents, or family can make all things new or permanently wipe away our tears. Only Christ can. Advent helps us to remember, amidst the culture’s clamor, to look to Jesus for our hope, joy, peace, and love. 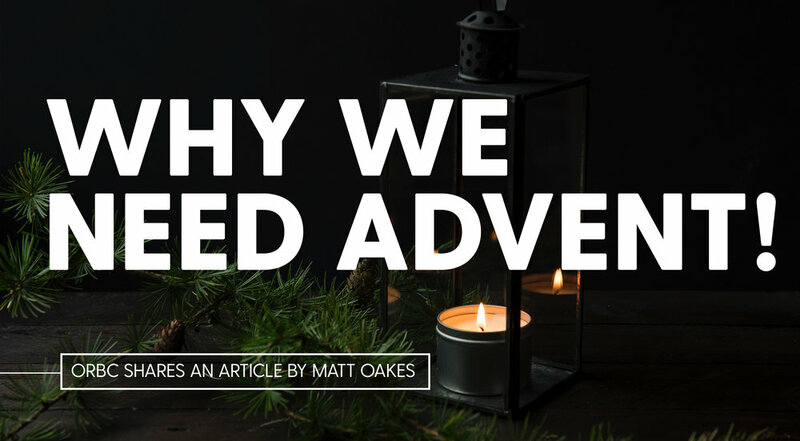 So how do our Advent traditions actually help us remember and anticipate Christ’s return? What does the scripture and symbolism of Advent help us see about Christ? The four weeks of Advent follow the individual themes of hope, peace, joy, and love. Each week we light a candle representing one of these themes. As we light these candles we are given the opportunity to examine if we are really finding our hope, peace, joy, and love in Christ, and express together that we believe they can only be found in the light of Christ. The candles are lit by people representing all parts of our congregation to help us remember that God has called all of us to proclaim the light of Christ. Throughout the season of Advent; we will see the colors of purple and white being used. These colors have been used for centuries by the church because they symbolize the royalty of Christ our King (purple) and the purity and light of Christ (white). Whenever we see these colors we are reminded that we serve a king who is with us shining light into the darkness of our world. Most obviously, we sing different songs throughout Advent. We don’t sing Christmas songs just because that’s what you do in December in church. We sing these songs because, with rich and beautiful language, they tell the true story of Christmas and point our hearts to be in awe and wonder of Christ. We celebrate Advent together because it gives us sanity in the midst of a busy month full of conflicting messages about what will make us truly happy. It helps us slow down, turn our eyes to Jesus, and remember. We remember that Christ has come, conquering sin, death, and evil. We remember that Christ is Emmanuel, God-with-us. We remember that Christ will come again to make all things new. Advent helps us fill our hearts with the hope, peace, joy, and love of Christ.